Scarce French nautical chart of the East Coast from New York to Florida. 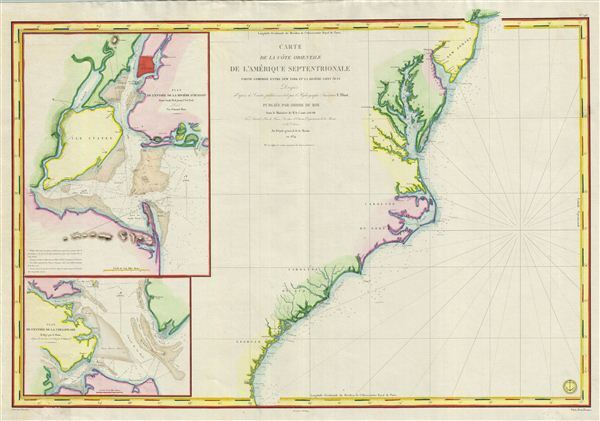 Carte de la Cote Orientale de l'Amerique Septentrionale Partie Comprise Entre New York et la Riviere Saint Jean. This is a highly scarce 1834 map of the eastern coast of the United States. The map covers the entire coastline from New York City to the St. John River in Florida, inclusive of the Chesapeake Bay, the Outer Banks, and the Carolina, Virginia, and Georgia coastlines. Two inset maps are included on the left. The upper map details the entrance to New York Harbor from Sandy Hook to Manhattan and from Staten Island to Rockaway Inlet. The lower inset details the entrance to the Chesapeake Bay. The whole is typical of nautical charts, offering limited inland detail but a wealth of nautical information including countless depth soundings, shore lines, river soundings, shipping lanes, and other practical information for the mariner. A fine example of a working sea chart. Cartographically this map was derived from the work of e. Blunt an American hydrographer and chart maker active in the private sector. It was updated and revised in 1834 by J. M Hacq and Chassant for issue by the French Depot-General da la Marine. The lower right corner bears the 'Depot General de la Marine' imprint. The map is dedicated to the King of France, Louis-Philippe, whose short post-Napoleon reign is best known as the July Monarchy. Very good. Original centerfold visible. Blank on verso. Minor fill repair lower left corner.